Designing and installing of outdoor spaces is a specialized job in that it requires the service provider to be knowledgeable and experienced about a range of products and materials and their installation. We at Mike's Lawn and Garden are a company that has been operating in this space for a number of years and have deep knowledge and experience about various aspects of landscaping. Over the years, we have provided end-to-end landscaping services to customers in and around Newport County, Providence County and Washington County. While we do handle complete landscaping projects, we also handle standalone projects for design and install of specific features on your property such as softscaping, hardscaping etc. Why Opt For Paver Clean And Seal? 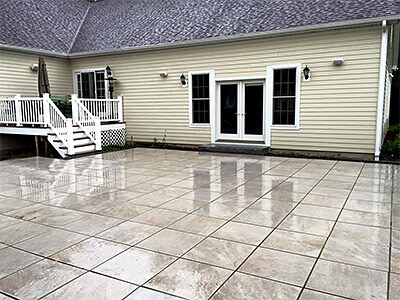 Many of our customers in and around Bristol County, Kent County, Plymouth County have also asked us for our excellent paver clean & seal services. Paving stones are almost an integral part of most landscaping projects. It’s common to see driveways, walkways, pathways, patios, decks, outdoor kitchen, poolscapes and other areas paved with brick, concrete or natural stone pavers. These become the perfect material for use in outdoor spaces and they are hardy and durable, low maintenance, easy to install and repair too. While maintenance is easy, it has to be kept in view that these features see a great deal of wear and tear and have to put up with climatic changes, the UV rays of the sun, and dirt and debris that’s part and parcel of any outdoor setting. This is why Paver Clean & Seal becomes very essential aspect of paving stone maintenance. 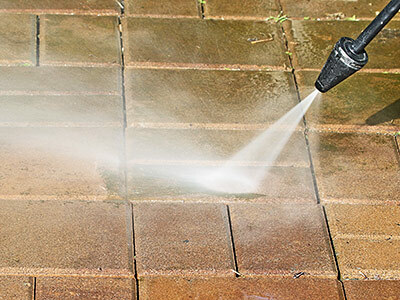 You will find that cleaned and sealed paving stones are easier to maintain and that the surfaces aren’t affected by oils and stains. We have the experience and expertise to tackle the job in the best possible way and to your 100% satisfaction. For more information about our specialized paving stone cleaning and sealing services, call Mike's Lawn and Garden at 401-835-6934. This online form can be used to send us queries. You can also request for a free estimate via this form.